A backpack made from recycled PET bottles? No way! This sturdy, rugged Palila pack from Ecogear is both toxin-free and PVC-free, and has a multitude of pockets to tuck everything needed for the day, from energy bars to sunglasses to water bottles, and even has a special MP3 player pouch with port. Ecogear’s bold Palila packs are environmentally-friendly and are available in Garnet,Charcoal, and Ocean colors. 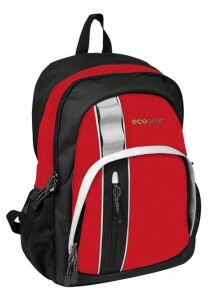 This functional backpack is on sale now on Ecogear’s website. To purchase, visit www.ecogear-products.com. One Man's Cross Country Crusade to Ban Plastic Bags! Recipe of the Day! Recipe of the Day!